The Clean Air Act is legislation that regulates how fuels are burnt in homes, commercial premises and smaller industrial operations. Its focus is on the use of solid fuels (e.g. coal and wood). Implementation and enforcement of the Act is carried out by local authorities; this is the boroughs in London and district or unitary authorities elsewhere in England. ‘Great Smog’ that caused the early deaths of 4,075 Londoners in 1952. In practice this means that in a SCA it is illegal to burn house coal or wood in an open fire, although it is legal to burn it in a stove or other appliance that has been approved to burn that fuel. It is also illegal for fuel retailers to deliver non-approved fuels to a premise unless the appliance the fuel will be burnt in is an exempt appliance. If the local authority has evidence that the occupier of a home (or a business premise) is breaking the conditions of a SCA their first course of action will normally be to ask them to stop. If they do not comply the local authority can prosecute them, which can lead to a fine of up to £1,000. How is Wandsworth Borough Council changing its Smoke Control Areas? The Wandsworth Borough Council area is currently covered by a network of 21 SCAs. The Council is proposing to consolidate these into a single borough-wide SCA to make the system easier to understand and enforce. If the changes are approved they will come into effect on 1 November 2012. The changes have little impact on the area covered by the SCA(s) or the penalties for non-compliance. Instead they represent the Council ‘dusting off’ the Clean Air Act. Most SCAs were established in the 1960s, but with the vast majority of homes now using gas or electricity for their heating needs regulation of domestic solid fuels has received little attention from local authorities in recent years. With renewed interest in wood and coal heating amongst the public other Boroughs have, or plan to, take similar actions to Wandsworth in order to rationalise their SCAs. 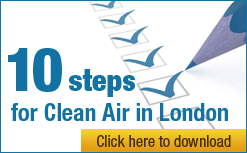 Why are the London Boroughs concerned about solid fuel burning? After several decades of declining solid fuel use there is an increasing interest amongst the public in burning solid fuel, with wood burning in particular becoming a major growth area. At the small scale (fireplaces and stoves) anecdotal evidence suggests that open fires and wood burning stoves are becoming increasingly popular. At the medium to large scale (boilers and combined heat and power) environmental standards in the planning system and the Government’s new Renewable Heat Incentive subsidy are stoking a boom in installations of wood burning equipment. London already has some of the worst air quality in Europe and is failing to meet legally binding, health based European standards for several air pollutants. These include dangerous airborne particles (PM10) and nitrogen dioxide (NO2). Solid fuels are considerably more polluting that natural gas (the main heating fuel used in London). In 2009 coal and wood burning in the home was through to be responsible for 12% of UK PM10 emissions (source – National Atmospheric Emissions Inventory), whilst research by King’s College London suggests that around 12% of the PM10 in London’s air during winter 2010 arose from wood burning. Is the Clean Air Act enough? The Clean Air Act is old legislation. The tests carried out to approve fuels and appliances are predominantly concerned with visible smoke rather than the ‘invisible’ pollutants (PM10 and NO2) that are of present day concern. Emissions from solid fuels and appliances permissible in SCAs can be many times higher than equivalent natural gas boilers. A 2008 study by Defra concluded that an increase in wood burning in the UK (to about 7% of UK heat demand) using wood burning appliances with average emissions would mean an extra 577 km of UK roads exceeding European limits for PM10 and health costs on UK citizens of around £2.8 billion. The Government’s Renewable Heat Incentive (RHI) will soon adopt emission limits that wood burning plant will need to meet in order to receive subsidy payments from the scheme. The Mayor of London has proposed to adopt the same limits for all new wood burning boilers in London that require planning approval. However, the proposed limit for PM10 (30 grams per GJ) is almost 60 times higher than emissions from an average equivalent natural gas boiler. The limits will also not apply to smaller open fires and wood burning stoves, which will not receive payments under the RHI. Many people believe that reform of the Clean Air Act is needed in order to give local authorities the powers to effectively manage emissions from solid fuel burning.